I’m generally a fan of anything that combines bananas and honey. So last night I tried out Martha Stewart’s Banana Cupcakes with Cinnamon-Honey Frosting. They were really good, the cupcake part is basically mini banana bread, which is awesome. I really liked the frosting too, although I have a feeling that a lot of people might not like the cinnamon/honey mix. So next time I’ll probably just drizzle them with honey and call it a day. 1. Preheat oven to 350 degrees. Line a standard 12-cup muffin pan with paper liners. In a medium bowl, whisk together flour, sugar, baking powder, baking soda, and salt. 2. Make a well in center of flour mixture. In well, mix together butter, mashed bananas, eggs, and vanilla. Stir to incorporate flour mixture (do not overmix). Dividing evenly, spoon batter into muffin cups. 3. Bake until a toothpick inserted in center of a cupcake comes out clean, 25 to 30 minutes. Remove cupcakes from pan; cool completely on a wire rack. Spread tops with Honey-Cinnamon Frosting. 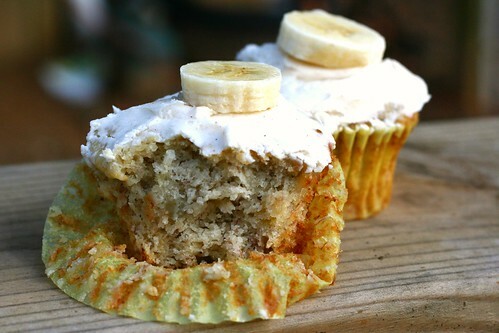 Just before serving, peel and slice banana into rounds, and place one on each cupcake, if desired. These look so very scrumptious! The frosting sounds good to me! it's very taste!!!! )))thanks for your recipe!!! These cupcakes look amazing, and all of your pictures are so beautiful. 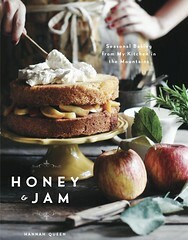 I can't wait to make these, thanks for sharing! those songs are some of my favorites, I'm glad you liked them. yum! 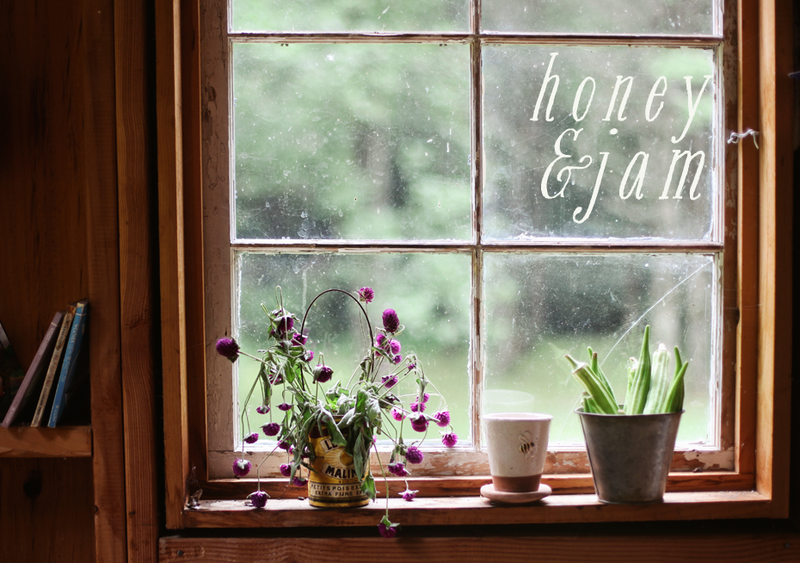 i love cinnamon and honey and bananas...i like the new header too, very nice. Your cupcakes look so good! I wanted to ask if you minded if I placed you on my favorite blog list on my blog. 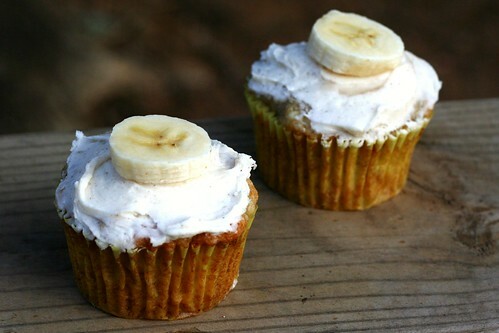 In my opinion, banana flavored anything is worth trying and those look soo good! i would throw a little cream cheese icing on that and be in heaving haha! I made these as soon as I saw them! I added walnuts to the batter though and just a touch of vanilla extract to the frosting. They were absolutely delicious! i love martha. although i'm envisioning almond butter incorporated into the fluffy frosting somehow!!!! Oh do those looks good!!! Ah I noticed the picture at the top has changed! yeah, i can't decide which one i like best. haha. I am a lurker: I found your link on a friend's blog. I just wanted to say how much I love your photography...It's beautiful. Everytime I visit I think, "wow, that should be in a cooking magazine!" I'm really into photography too, but I've never been that sucessful when "shooting food!" i'm at work right now and actually exclaimed aloud when i saw the title of these cupcakes. the girl i share an office with gave me a weird look. whoops! :) my goodness, these look AMAZING! also, to answer your question about lightroom: i LOVE it. i definitely have figured out how to use all the features yet (i like taking baby steps), but the ones i have i really love. although the thing about editing is that i tend to go overboard at times because i have so much fun with it. but i've never used elements before. have you heard of Pioneer Woman? she has a photography section of her blog and while she has a couple of posts about lightroom, she mainly uses photoshop and elements. you should check out the stuff she says about elements to see if it strikes your fancy. i do love lightroom, though.